Fundador de la nacionalidad Cubana, presbitero, educador, filosofo, orador y escritor, defensor de los derechos humanos y civiles en Cuba y en los Estados Unidos, padre de los desamparados Inmigrantes Irlandeses, promotor de la education Catholica y la convivencia entre Catholicos y Protestantes, pionero del periodismo Catholico en Norte-America, precursor en el campo del bienestar social, Vicario General de la Arguidiocesis de Nueva York 1829-1853, fundador de esta parroquia 1827. This marker is to the left of the furthest door. Founder: Very Rev. Msgr. Raul Del Valle, P.A. Founder: Most Rev. Eduardo Boza Masvidal, D.D. Erected 1988 by The Felix Varela Foundation, Union de Cubanos en el Exile. Location. 40° 42.733′ N, 73° 59.92′ W. Marker is in New York, New York, in New York County. Marker is on James Street, on the left when traveling south. Touch for map. 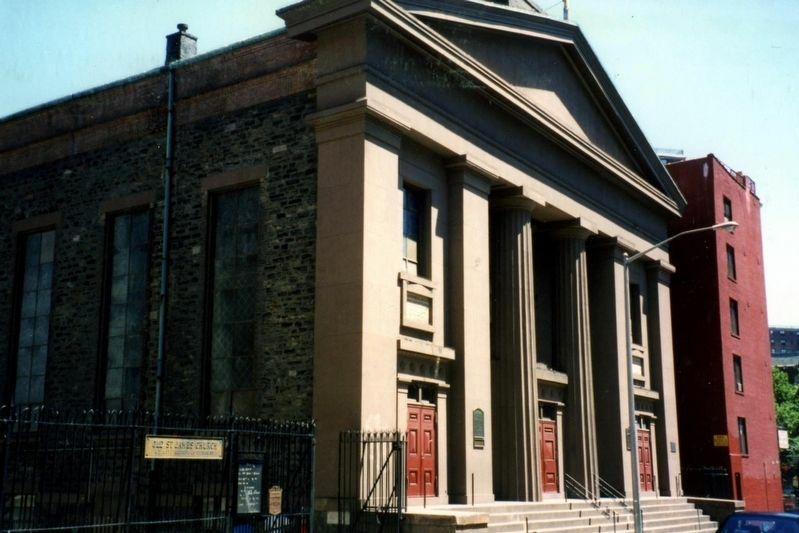 Marker is at or near this postal address: 32 James Street, New York NY 10038, United States of America. Touch for directions. Other nearby markers. At least 8 other markers are within walking distance of this marker. Ancient Order of Hibernians (here, next to this marker); St. James' Church (here, next to this marker); PFC Frank Vallone, USMC (a few steps from this marker); Hall of St. James’ School (within shouting distance of this marker); Alfred E. Smith House (within shouting distance of this marker); St. James Square (within shouting distance of this marker); First Shearith Israel Cemetery (about 300 feet away, measured in a direct line); The First Jewish Cemetery in the United States (about 300 feet away). Touch for a list and map of all markers in New York. More about this marker. 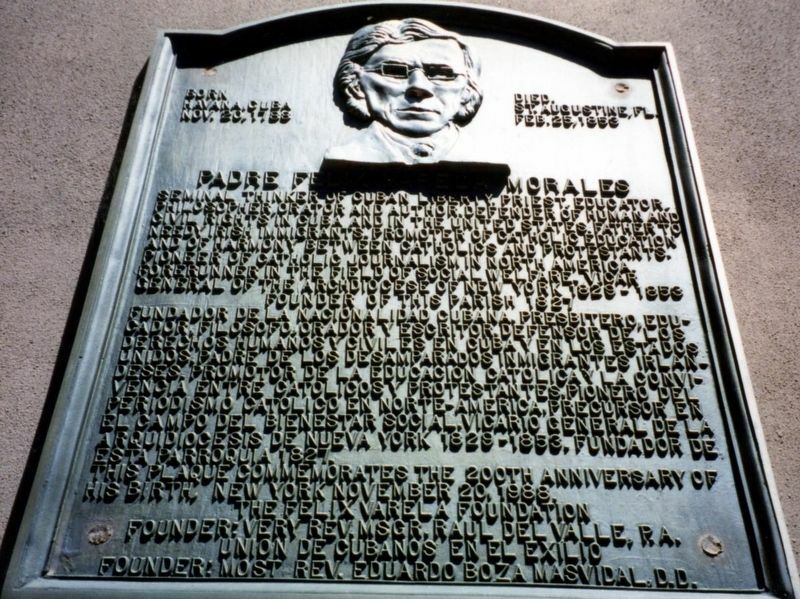 This marker is an exact duplicate of the one at The Church of the Transfiguration, 25 Mott Street. More. Search the internet for Padre Felix Varela Morales. Credits. This page was last revised on April 2, 2019. This page originally submitted on October 13, 2018, by Larry Gertner of New York, New York. This page has been viewed 24 times since then and 8 times this year. Last updated on April 1, 2019, by Larry Gertner of New York, New York. Photos: 1, 2. submitted on October 13, 2018, by Larry Gertner of New York, New York. • Andrew Ruppenstein was the editor who published this page.